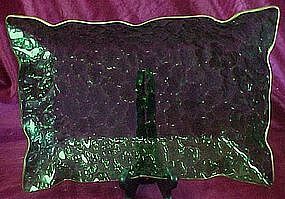 Nice large rectangle shape (8 1/2" x 13")green bowl with gold edge trim. Smooth inside surface and outer surface has the 3-D pebble pattern, that looks like rain drops on a window. This is a bright pretty green, and the gold accents it nicely. 1 3/4" deep and is in perfect condition. Photo does not show color very well.